this is where gym class is being held now. The Flying Grass Carpet looks like a gigantic Persian rug and is made of different kinds and colours of artificial grass. Whenever The Flying Grass Carpet comes to a city, people greet it enthusiastically. It creates spontaneous encounters and bonds citizens. Two Rotterdam agencies are responsible for the concept, design and execution: HUNK-design and Studio ID Eddy. The concept for The Flying Grass Carpet was developed in 2007. It began with two objectives: improve public spaces in cities and create a bond between people living in cities around the world. 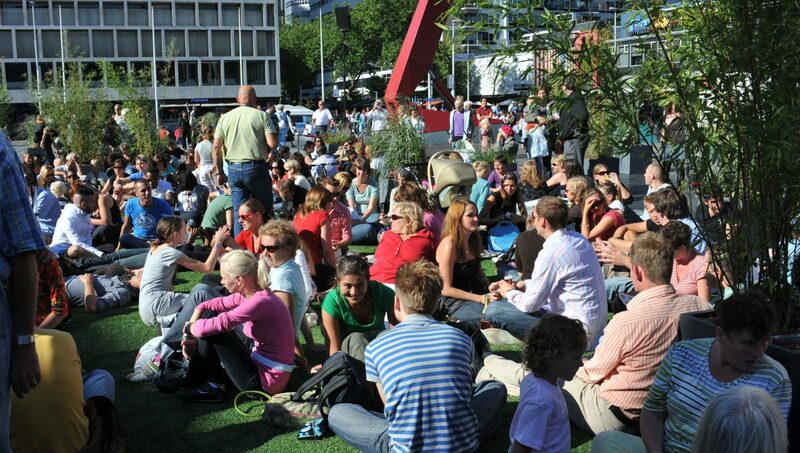 Since an increasing number of people choose to live in cities there is a growing demand for attractive public spaces. The Flying Grass Carpet is capitalising on this need. 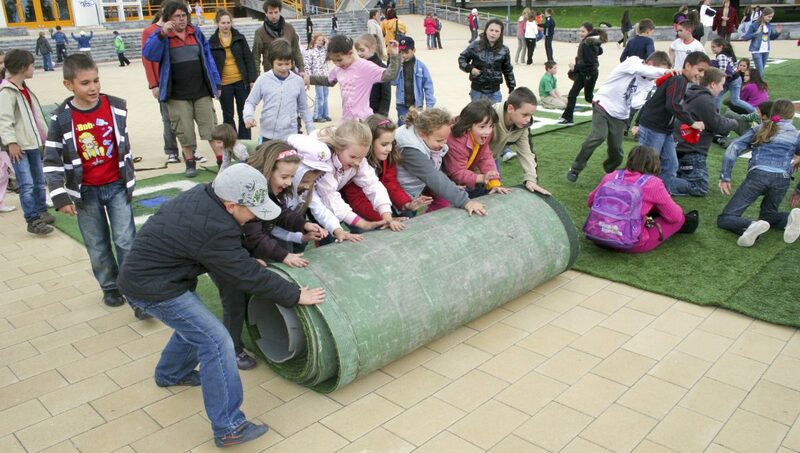 A family of Carpets has been developed that will turn any location into a positive experience: The Flying Grass Carpet Original, The Junior Carpet and The Baby Carpet. The sizes of the Carpets vary from 45 to 900 square metres. All of them are made of colourful artificial grass. The appearance, inspired by Persian rugs, instantly creates a soft, inviting and homely atmosphere in all of these squares. That’s evident from their use. The Willy-Brand-Platz in Essen, which locals used to cross and never linger, was transformed into a square that was a popular venue for birthday parties. The Grotekerkplein in Rotterdam was suddenly discovered by bootcampers who started to train there. And in the evening, Madrileno friends met at the stony courtyard of the Matadero to enjoy the cool evening air. The Flying Grass Carpets travelled to more than 20 destinations: from nearby Rotterdam to faraway China. The family of Carpets was expanded in August 2017 with The Giant. This new Carpet was designed specially for the Rotterdam Schouwburgplein. The Carpet covers a surface area of 3,500 square metres, which makes it the largest Carpet in the series and even the biggest pop-up park in the world. The Giant is composed of smaller carpets, intended to give the scale of the square more human proportions. Every individual Carpet contains an architectural Rotterdam icon that has been worked into a floral pattern. Large, living plants have been added to the pop-up park to further enhance the perception of green. 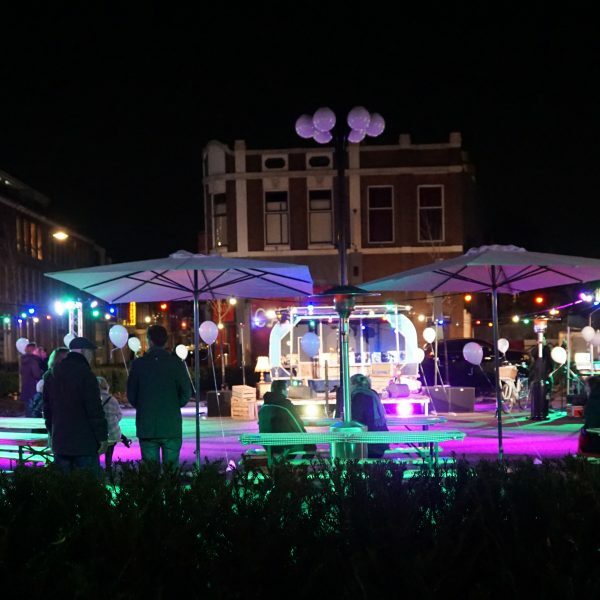 It’s important to mention that the Schouwburgplein ranks eighth on a list compiled by Project for Public Spaces (PPS) identifying squares in the world most urgently in need of improvement. This pop-up park serves as inspirer and test case for future adaptations of the square. Studio ID Eddy and HUNK-design initiated their own method of placemaking with the design of The Flying Grass Carpet. When you regularly walk past a place or spend time in it, then you no longer notice certain characteristics. As a result, you lose track of the location’s potential. What the designers of The Flying Grass Carpet have managed to do is to get people to temporarily perceive the spot in a different light. People slow down, sit on the Carpet and literally look at this familiar place from a different perspective. By injecting more quality into a square, The Flying Grass Carpet provides new inspiration and heightened ambition. The designers call this placetesting. 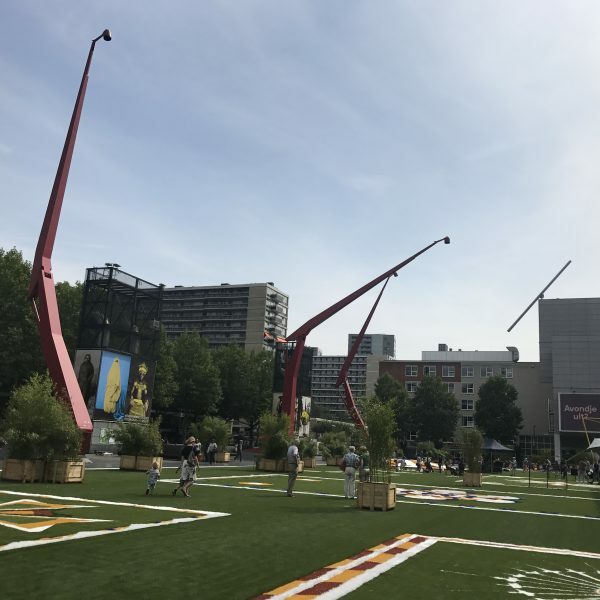 The Flying Grass Carpet has been deployed in a targeted way in several cities to gain experience that can be applied in new designs for squares. This concept was recognised in 2009 with a Dutch Design Award, and in 2014 it earned a place on The CNN 10: Better by Design list. Another aspect of The Flying Grass Carpet is that it gives city dwellers around the globe a sense of community. When you sit on the Carpet and your fingers touch the grass, you can imagine someone in Shenzhen or Berlin having done exactly the same thing. You see a child jump from colour block to colour block and you know that there were kids playing just like that in Pécs. The main insight gained from ten years of experience with The Flying Grass Carpet is that people all over the world respond identically to an inviting public space. They share the same curiosity, playful attitude and need for relaxation, wherever they are. The Flying Grass Carpet will embark on many more beautiful journeys in the future, create a bond between city residents and continue to inspire. You can follow its adventures on www.flyinggrasscarpet.org. If you’re dreaming of The Flying Grass Carpet paying a visit to your city, then contact Bart Cardinaal, Nadine Roos (HUNK-design) or Eddy Kaijser (Studio ID Eddy). Who knows, maybe your town or city will become part of The Flying Grass Carpet’s adventurous fairy tale journeys.